Wheelersburg’s Brooke Smith runs for Shawnee State in a prior event. The Shawnee State track and field program competed at the Raleigh Relays, hosted by North Carolina State, the WashU Invitational, hosted at Washington University (Mo. ); and at the Yellow Jacket Invitational at Cedarville University (Ohio). 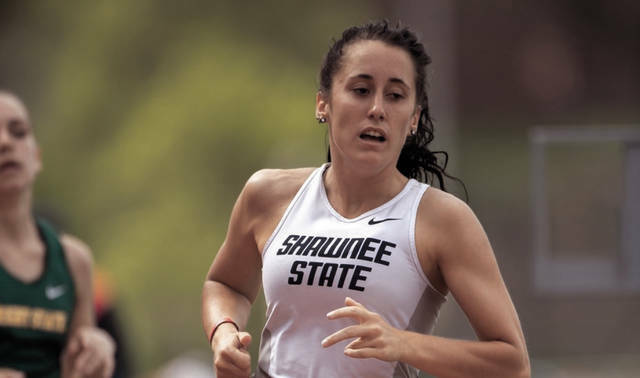 Shawnee State had a pair of runners set new school records at the Raleigh Relays on Friday. Seth Farmer (JR/Waverly, Ohio) set a new record in the men’s 1500 meter run, finishing 29th overall in a record time of 3:50.50. Brooke Smith (JR/Wheelersburg, OH) also broke the school record for the women’s 1500-meter run, finishing 75th overall with a time of 4:38.39. Shawnee State also had a small team at the WashU Invitational in St. Louis. Alyssa Taylor (JR/Georgetown, OH) was Shawnee State’s best finisher of the weekend, finishing eighth overall in the 10,000-meter run with a time of 37:47.44. Kate Spencer (SR/Glouster, OH) also competed for SSU, finishing 18th in the 10,000-meter with a time of 39:35.73. Owen Reeher (SO/Kinsman, Ohio) was the best finisher for Shawnee State on the men’s side, finishing 25th overall in the 10,000-meter run with a time of 32:00.79. Cody Redman (SR/Circleville, Ohio) was also in action over the weekend, finishing 89th in the 5000-meter run with a time of 15:48.45. Shawnee State also had a team at the YellowJacket Invitational, hosted by Cedarville. Marissa Smith (FR/Logan, Ohio) was the best finisher on the women’s track side, finishing 13th in the 1500-meter run with a time of 5:24.15. Shae Patty (FR/McDermott, Ohio) was the women’s best field finisher with her third-place finish in the high jump. Patty leaped a shade over 1.63 meters. Chris Parsons (FR/Middletown, Ohio) had the best finish for Shawnee State men’s track, finishing sixth in the 10,000-meter run with a time of 35:32.23. Hunter Bennington (FR/South Webster, Ohio) picked up a top 10 finish in the 1500-meter run, finishing seventh with a time of 4:15.07. Shawnee State’s best field finisher was Hunter Ashton (FR/Proctorville, Ohio), who finished 17th with a throw distance of 32.68 meters in the javelin throw.